The Prancing Moose badge gets slapped on various Volvo rides, but this next car deserves the badge more than most. It might have started life as a simple 240DL, but it is now a beast of a machine that'll terrify driver, passenger, and pedestrian alike. 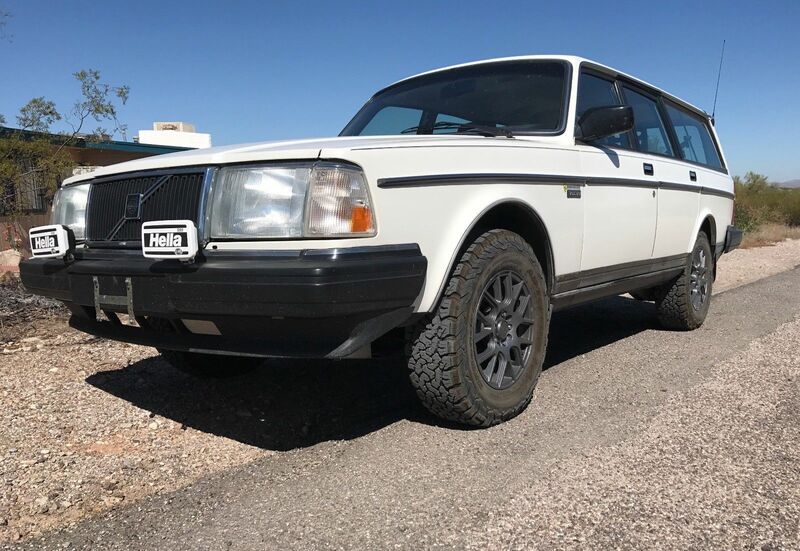 Find this 1989 Volvo 240 DL V8 here on eBay bidding for $7,100 with 3 days to go, located in Tucson, AZ. This is a truly unique and awesome rally car / battle wagon of a Volvo 240, painstakingly built by Legacy Classic Trucks of Driggs, Idaho. Classic reliability of the Volvo 240 Brick coupled with modern GM American muscle of a V8. The car began as a beautiful condition Volvo 240DL wagon, and then Legacy went to work. They rebuilt the entire suspension, motor mounts, fuel system, exhaust, and drivetrain. It is a car that gets looks without being gaudy - and is truly at home on the dirt. Legacy Classic Trucks is a top-tier professional shop, with extensive experience with suspension design and GM V8 conversions - check out their other work at their web site (google Legacy Classic Tucks - eBay does not allow a direct link in this description). So, what was done? Note that the vehicle is fully emissions compliant, and is currently registered in Pima County, AZ, having passed their emissions testing with flying colors. Gas mileage has average 20mpg for me. The horsepower is put down to the road through new BF Goodrich KO2 All-Terrain tires, ideal for poor terrain, sand, mud, snow, etc. This beast will go anywhere and through anything, thanks to the limited-slip rear differential. To match the engine power, the brakes were upgrades with new discs and oversize Mazda calibers in front (new discs and standard calibers in the rear). 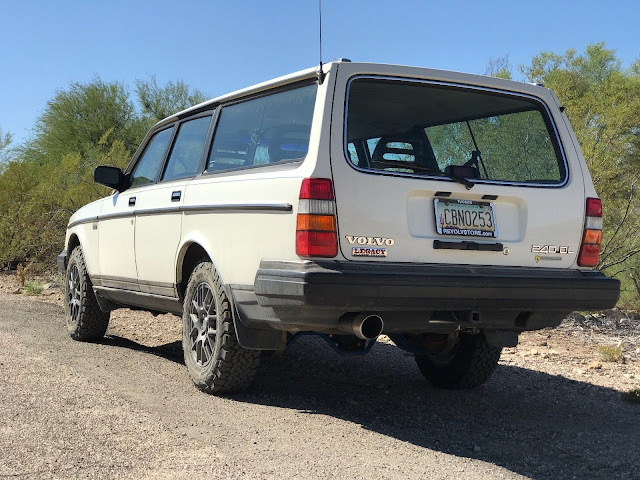 This is not some shade-tree hack job, it is a professionally built expression of what a massively powerful and capable vehicle the classic Volvo 240 series vehicle can become. The package is much more than the sum of the parts, expertly engineered by Legacy. It can blow down the freeway for long road trips, it can take on the worst backroads and adventure spots. It has outstanding visibility and a massive amount of cargo space with fold-down rear seats. It is a truly one-of-a-kind car for the connoisseur who is tired of the same old things. I have driven this about a thousand miles total, and it runs great. Extremely powerful and reliable. My driving was done in Phoenix and Tucson in the peak of the summer, and it has no problems with engine temperature, and the A/C blows nice and cold. The base car for the project had just under 90,000 miles on it when work began, and the it has about 1000 miles on it in its new form. I have gotten all the bugs worked out for you, but I can't keep it myself - I have gotten financially overextended and have to let it go. Let my loss be your gain! Not happy with it as it sits? Well, there are a couple more elements that could be upgraded further. A cruise control box has been added to the dashboard, but the requisite control module has not yet been added. The weakest point on the build is the rear axle, which could be replaced with a stronger unit. The stock Volvo axle and differential are just fine for 99% of driving, but if you really want to unleash all the ponies from the engine and put it into really extreme conditions, that would be something to consider (and it would be a very straightforward modification to make). This thing is awesome! I have no idea what I would do with it, but I know I want it!